Update as of 112118- I’m not making these very often anymore but there are still some in stock at Kingston Square Arts in Kingston, AR. 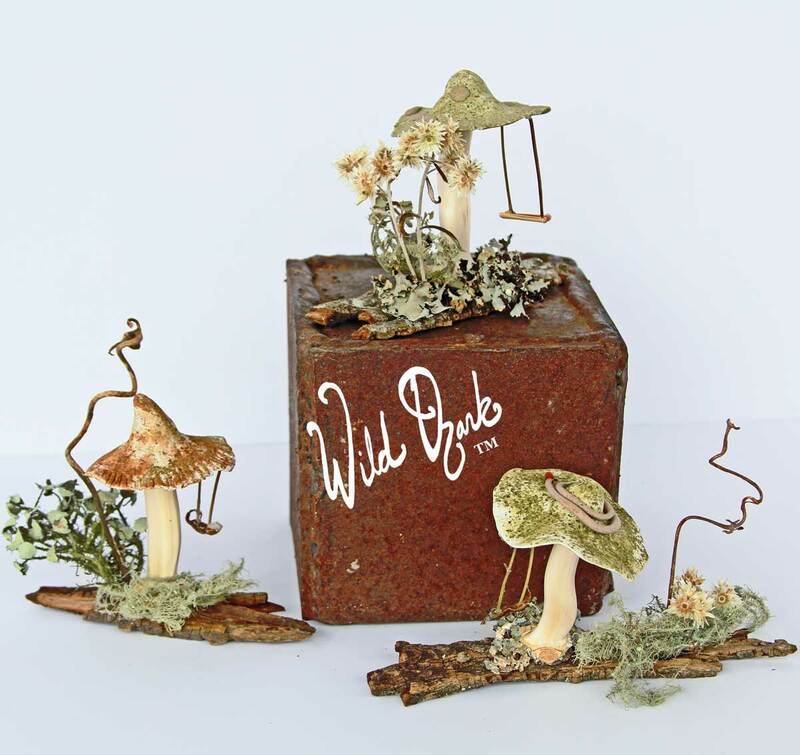 These adorable little fairy swing mushrooms are the latest creations from the Wild Ozark studio! Each of the Fairy Swing Mushrooms are handmade and one of a kind (OOAK). Rather than painting the caps, this time I decided to use something natural to add the color. The mushroom caps are polymer clay infused and dusted with powdered sassafras leaf (filet’ gumbo herb) and cinnamon. Follow me on Instagram (@wildozark) to see the new ones as I make them. Powdered sassafras leaf on the cap of this mushroom. The stem is made from an elephant garlic stem. The cap on this one is colored with powdered cinnamon. The fairy swing mushrooms are mounted on a small slab of shagbark hickory. It’s decorated with moss, lichens, dried rabbit tobacco flowers. Two of them have a vine tendril. The swings themselves are made from beebalm flower stems and a bit of leaf or grass for the seat. The caps are made from polymer clay mixed with and coated with cinnamon and gumbo file’ (sassafras leaf). Here’s more, colored with cumin and trimmed with sassafras leaf powder. The ones I haven’t sold yet will be with me on Saturdays at the Fayetteville Farmer’s Market. If I still have them when I get home, I’ll list them at Etsy and put them in our online shop here on Sunday (or one day soon). They can be shipped. Bring a little Wild Ozark nature home with you! From @cmwhitson: I got mine today, and the photo doesn’t do it justice. This is the cutest little mushroom swing EVER and I truly love it! It’s so delicate and wonderful, and thanks for using biodegradable peanuts to pack it. What an incredible artist you are!! ? Follow me on Instagram (@wildozark) or FB to see the new ones as I make them. New ones are added almost every week.